Saint Miriam will be the next home for the WE ARE ALL HOMELESS project. The exhibit will feature a cross-section of the works from Willie Baronet on two levels of the parish. We will also tie into this exhibit our Lenten experience for 2019. We will sink more deeply into how we live a life of service and care for the marginalized and the lost and the lonely. We will try to deepen our own willingness, too, as we seek the homeless, the food insecure, and the forgotten. From the opening of the exhibit on March 9th to its closing celebration on April 27th, we will become homeless. The WE ARE ALL HOMELESS project began in 1993 due to the awkwardness its founder, Artist and professor, Willie Baronet, felt when he pulled up to an intersection and encountered a person holding a sign, asking for help. Willie has since purchased more than 1,300 homeless signs over the past 24 years, and he uses this collection to create installations to raise awareness about homelessness. Like many of us, he wrestled with whether or not he was doing good by giving them money or to simply ignore them or avoid their steel gaze. Mostly he admitted the internal struggle with his moral obligation, and how his own choices contributed in conscious or unconscious ways to poverty. Willie struggled with the unfairness of the lives people are born into, the physical, mental and psychological handicaps. In his struggle, he avoided eye contact with those on the street, unwilling to really see them, and in doing so – like most of us – avoided seeing parts of himself. That changed once he began asking these people if they would sell their signs! Willie’s relationship to the homeless has been powerfully and permanently altered and now, so has the world. Here at Saint Miriam, at our front doors, when you first arrive to our parish, you are greeted by a beautiful life-sized bronze statue by world-renowned artist and sculptor, Timothy Schmalz. 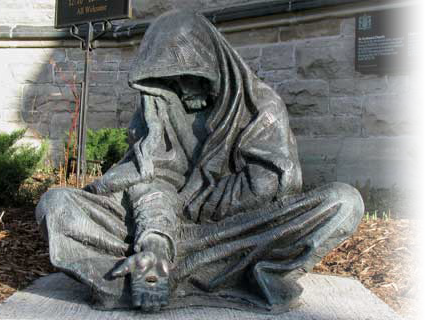 The piece is entitled, “Whatsoever You Do”, and has been dubbed, ‘The Beggar Christ.’ The sculpture is based on the Gospel of Matthew, Chapter 25, and suggests that Christ is one with the most marginalized in our society. It is a strong, visual representation of what our parish represents: an inclusive home, a strong welcome, with deep and abiding hospitality for everyone, without any reservations. We welcome everyone and for us, it is more than a trite motto; it is our mission. For the last ten years, we have welcomed the rejected and the marginalized. We have endeavored to treat everyone as a living soul with inherent dignity that is deserving of our love and protection and welcome. From being the first Catholic Parish to welcome gay and lesbians to full inclusion, to our extending hospitality to the Transgender and questioning. From our welcoming the immigrant and the ex-offender, to our support groups for families, the addict and the recovering, to our swinging wide the doors of our campus to those mourning the loss of their best friend in our Angels of Assisi Pet Memorial Garden, to our constant reminder of our goal to welcome all, including those seeking sanctuary, we have been a haven to those who seek refuge and the love and embrace of God. We have much to be proud of and more to do. There have been over 30 art installations of WE ARE ALL HOMELESS since 2009 in the US and UK, including exhibits at NYU, University of Pennsylvania and the University of Cambridge. In 2016 we were honored to exhibit in Philadelphia and Cleveland during both the Democratic National Convention and the Republican National Convention. In Philly we were part of Truth to Power, a group show sponsored by Rock the Vote, which included artists Banksy, Ron English, and Shepard Fairey. The installations provide an experience for people to explore the humanity of the signs, and questions regarding the nature of home, compassion and what it means to truly see each other. We will close our exhibit in late April after Easter comes again. We will use this time to screen SIGNS OF HUMANITY, a documentary film where Willie and three filmmakers drove across the country, interviewing more than 100 people on the streets and purchasing over 280 signs that explores inter-related themes of home, homelessness, compassion, and humanity as well as engage ourselves and the community through a Q&A session that will feature Willie, a former homeless man and now advocate, Eddie Dunn, (someone Willie actually purchased a sign from), Tom Costello, founder of the Joy of Sox, and Dr. Rosie Frasso who did the research project at Jefferson University. This will be a spectacular day! If you would like to support this Art Installation and project, please click on the link below! Saint Miriam in the News! Join us for Holy Week! Holy Thursday at 6:30pm, Good Friday at 3:00pm, The Great Vigil of Easter at 8:00pm, and Easter Sunday at 9:00am! Helping Our Blessing Bag Program Just Became Easier! Have checked out the shop? CD’s and Holding Crosses! Altar Flowers @ Saint Miriam! Wedding Gowns and a Priest? … Yes! Food “Blessing Bags” Come to Saint Miriam! Take a Walk with us Through The Holy Mass! Join us as we walk through the Mass Liturgy with Bishop Barron and gain insights an deepen your encounter with Christ each week! The special edition, The Mass, will be presented in DVD format in 6 sessions followed a discussion. Each session will last approximately one hour. Sign up today! Sanctuary Lamp and Bread and Wine Sponsors Needed for the New Year! Please make your Mass intentions and sponsor the Sanctuary Lamp for the New Year! Click Here to honor your loved ones during this coming year and support your parish! MySaintMiriam.org uses MXGuarddog.com as our spam blocker.